We know that the birthplaces of stars are large molecular clouds of gas and dust found in space. But what exactly determines the number and kind of stars and planets that are formed in these clouds? How was our Solar system nursed and how did it emerge from such a cloud billions of year ago? These are mysteries that have been puzzling astronomers for decades, but research published today in Science adds an extra dimension to our understanding. Knowledge of the 3-dimensional structure of these clouds would be an important leap in our understanding of how stars and planets are born. The physics responsible for the formation of stars is also responsible for shaping the clouds. But even with the most advanced telescopes in the world we can only see the two-dimensional projections of clouds on the plane of the sky. Thankfully, there is a way around this problem. A recently discovered type of structure in molecular clouds, called striations, was found to form because of waves. Here enters Musca, a molecular cloud that "sings". Musca is an isolated cloud in the Southern sky, below the Southern Cross, that looks like a thin needle (see top image). 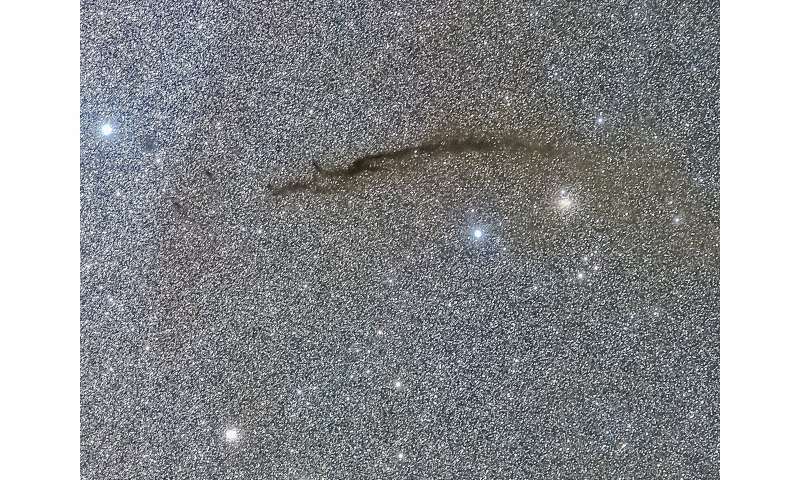 It is hundreds of light years away and stretches about 27 light years across, with a depth of about 20 light years and width up to a fraction of a light year. Musca is surrounded by ordered hair-like striations produced by trapped waves of gas and dust caused by the global vibrations of the cloud. Trapped waves act like a fingerprint – they are unique and can be used to identify the sizes of the boundaries that trapped them. Boundaries are naturally created at the edges of clouds where their physical properties change abruptly. Just like a cello and a violin make very distinct sounds, clouds with different sizes and structures will vibrate in very different manners – they will "sing" different "songs". By using this concept and calculating the frequencies seen in observations of Musca it was possible to measure for the first time the third dimension of the cloud, the one that extends along our line of sight. The frequencies found in the observations were scaled to the frequency range of human hearing to produce the "song of Musca". The results from this method were amazing. Despite the fact that Musca looks like a thin cylinder from Earth, the true size of its hidden dimension is not small at all. In fact, it is comparable to its largest visible dimension on the plane of the sky. Musca is not actively forming stars. It will be millions of years before gravity can overcome all opposing forces that support the cloud. As a result, with its structure now determined, Musca can be used as a prototype laboratory against which we can compare our models and study the early stages of star formation. We can use Musca to better constraint our numerical models and learn about our own Solar system. It could help solve many mysteries. For example, could the ices found in comets have formed in clouds rather than at a later time during the life of our solar system? Well, isn't that interesting. Your average EU acolyte would have misinterpreted this as a filament when in fact it is a slab. 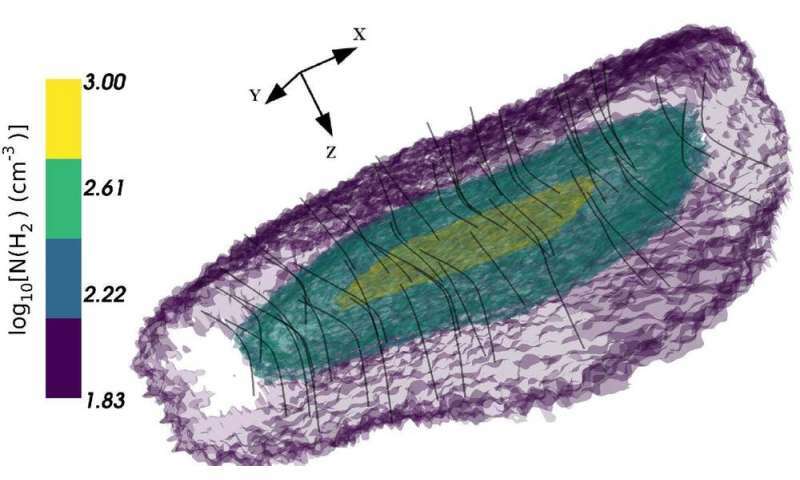 A sheet is another expected morphology of plasma currents, no surprise here. It does pose another problem for the standard theory unless flat dark matter is proposed. And amusingly, no further comment from babakn given the obvious difficulties this poses for the standard theory. The only reasonable explanation is this is an electrically driven plasma process. This is another example of coupled periodic oscillators. The global vibrations are periodic oscillations. The large scale vibrations give rise to the trapped waves which lead to parallel series of striations. Three systems of coupled periodic oscillations (global vibrations, trapped waves, parallel striations), all self-organized and interlinked.